Prairie River’s Ryan Martin attempts a pass while teammate Zylo Badger, left, appears on the scene ready to help. On the right is St. Andrew’s player Caleb Pruden. Both High Prairie junior high schools have earned bragging rights, at least for the moment. 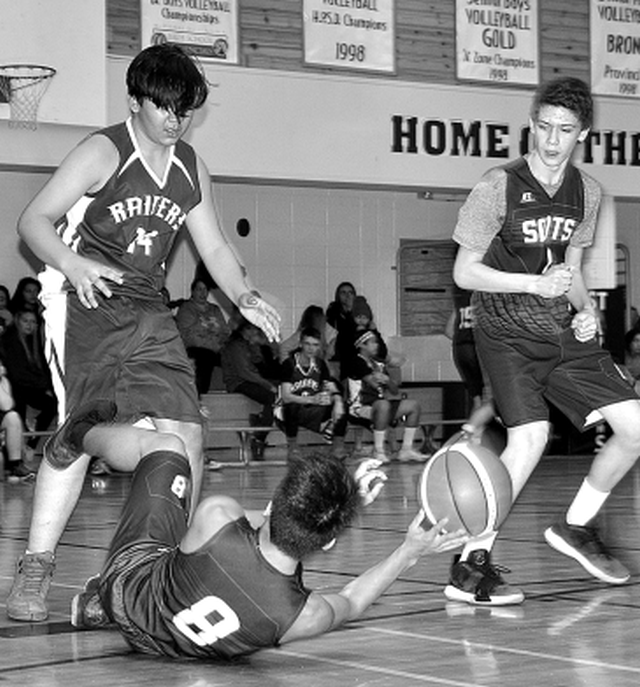 The St. Andrew’s Saints hosted the Prairie River Raiders in junior school basketball league action Jan. 23 with the St. Andrew’s girls winning 55-23 and the PRJH boys 52-46. In the girl’s game, the Saints rolled to another win. In their four wins this season, the Saints have outscored their opposition 243-68. They led 22-4 after one quarter and 40-6 at the half. Abbie Cottingham and Ella Deering each scored 14 points to lead the Saints while Finn Marko added 12. Elle MacIntosh scored six points while Heidi Poriskly, Brooke Gauchier, Kelly Cox and Joseah Pecpec each added two points. Jessie Zuniga added a free throw. Rachelle Lemay scored a game-high 17 points to lead PRJH while Amira Sharkawi, Cassidy Barry and Anna Nobert added two-point buckets. In the boy’s game, PRJH took quarter leads of 15-7 and 30-16. PRJH added to the lead at three quarter time, leading 48-30 but the Saints rallied in the fourth quarter outscoring PRJH 16-4 but it was not quite enough. Six Raiders tallied scores including Dave Espina’s game-high 16. Ryan Martin scored 13 points and Mondi Lascuna 11 as three Raiders high double figures. Zylo Badger added six points, Leon Palisoc four and Jeshua Gilroy two. Ethan Smith scored 15 points and Seb Vasquez 13 to lead the Saints. Keenan Price added six points and Clarence Lindo four while Jace Supernault, Caleb Pruden, Coby Masson and Brenden Kasinec each added two points. This week, the Saints host the Donnelly G.P. Vanier Jan. 30.